MaxSonar Sensor Acoustic Noise Tolerance Test | MaxBotix Inc.
It’s a little-known fact that all of our MaxSonar products have been designed with a high acoustic noise tolerance. This means that the MaxSonar sensors from all of our product lines work to reduce or eliminate false detections caused by external noise sources. 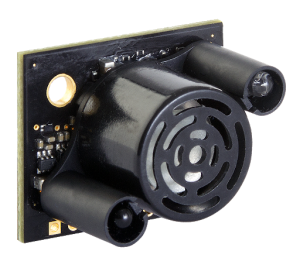 While acoustic noise tolerance is only a small part of our “sensor magic”, that provides our users with reliable and stable range information. It is a critical factor for some of our users. Recently, some of our users in the UAV community have been asking questions about the difference in noise tolerance between our LV‑MaxSonar‑EZ products and our XL‑MaxSonar-EZ/AE products. As a result, MaxBotix Inc. felt that it would be a good idea to provide our users with test data for each of our current sensors ability to reject acoustic noise sources. First, decibels (dB) are reported on a log scale. If you are not familiar with decibels, an increase of 3dB equates to an increase to double the volume. The noise tolerance for our products fall between about 91dB and 106dB and this can seem foreign to many people. To keep this in perspective: a passing train at 30 meters is about 90dB, and a passing train at 1 meter is about 105dB. This means that both the LV and XL product lines have incredibly high acoustic noise tolerance since our noise tolerance falls within this dB range. Second, all of our XL-MaxSonar-EZ/AE products are significantly more tolerant of acoustic noise than any of the LV-MaxSonar-EZ products, and the data shows this. 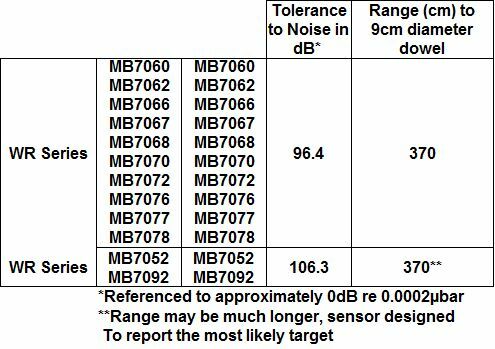 The noise tolerance data shows the dB level where the noise began to affect the operation of the sensor. For this test, any noise level which caused 1 or more incorrect readings to occur out of 100 range readings was recorded. The maximum distance to which the sensor will detect a standard target, a 9 cm (3.5 in) diameter dowel, is provided for reference. This allows for easy comparison between the products for the ability of each sensor to detect small objects. The extra acoustic noise tolerance of the XL series is readily apparent. We encourage users who desire noise suppression along with extra sensitivity to use the XL-MaxSonar-EZ/AE or the XL-MaxSonar-WR/WRC sensors. The noise threshold was set where acoustic noise caused one incorrect reading out of 100 range readings. We designed the test to evaluate the real world use of the sensors and to allow comparison between MaxBotix Inc. sensors. We used a noise source that produced a pulsating acoustic source of 30KHz to 50KHz sweep at a 60Hz rate. This caused large spikes of noise within the sensor frequency band. The acoustic noise source was placed about 50cm to the side of the sensor under test, with an output up to 120dB. This acoustic noise source was set up to direct the energy towards a large flat target, (which would then be reflected back to the sensor under test). A large flat target was placed 1.5 meters from the sensor. This target at 1.5 meters allowed the sensor to report 1.5 meters as a valid target. We increased the noise source output until the noise just began to change the sensor output. The noise level was then decreased until no incorrect readings occurred. This was recorded as the threshold.